High-altitude training at sea level is not for the easily embarrassed. For the past few weeks, daybreak sees Jayanthi Kuru-Utumpala and Johann Peries rise and gather their gear before they head to the beach or to a park. 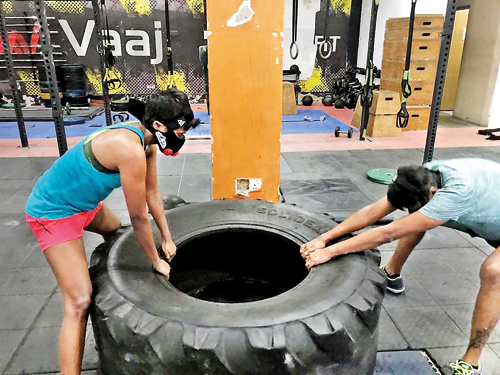 Endurance training has them pitting their strength against the high waves or lifting 20-kg weights in each hand while wearing contraptions that stretch over most of their faces, leaving only their eyes peering out at you. No one can resist a double-take. “You can hear us breathing so loudly, you turn around and it is like Darth Vader is running up to you,” says Johann, laughing. They’re praying the weather will hold during their 20 days on the mountain. The two will be rotating between camps to help them acclimatize before making a bid for the summit. They have the option of a more leisurely climb, but have instead opted for the technically challenging Polish Glacier route which will take them off the beaten track. 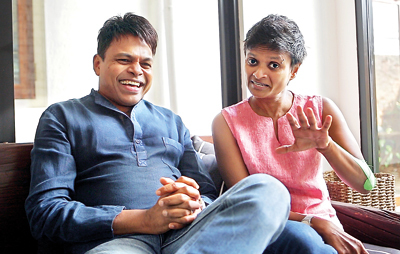 Only one mountaineering company offers guides for this option, but Jayanthi and Johann were convinced it was the one they wanted. For the first time, the two will be using dual ice axes for a significant stretch of wall – even on Everest, they relied on Jumars which allowed them to ascend on ropes. Now, Aconcagua will force them to master new skills and test their readiness. It’s an expensive undertaking, costing each of them roughly Rs. 2.5 million. There is more scrutiny this time around too – aside from all the media attention, they have thousands of followers online, and will be posting frequent updates on their Facebook page ‘Seven Summits Challenge – Johann & Jayanthi/Sri Lanka.’ Sponsors, including Adventure SEALs/Petzl and Wurth, are stepping in to help out, but the pressure to make it to the top can still feel immense. Johann, who experienced technical difficulties and did not summit Everest on his first attempt, knows how bitterly disappointing it can be to fall short of his goal. Why not take the easier route, where a summit attempt is more likely to be successful? “If we were to say there is no fear in us, we would be lying,” he admits, describing how the first sight of a mountain can intimidate you in an almost visceral way. He adds: “But this isn’t about ticking off some boxes for us.” Instead, Johann is determined to learn from any mistake, and take every precaution he can. Published in the Sunday Times, Sri Lanka on January 27, 2019. By Smriti Daniel.